I have recommended to board members in the past that they do NOT use a feature of our website called “Content Moderation”, which allows a board member to moderate (review) postings by residents and approve them before they are published on the site. My basic premise is that moderation bottle-necks communication and discourages residents from posting. I know, I can hear it now, “You built a feature that you recommend people don’t use?” Yes, we did because content moderation has it’s place, but it should never be the default. 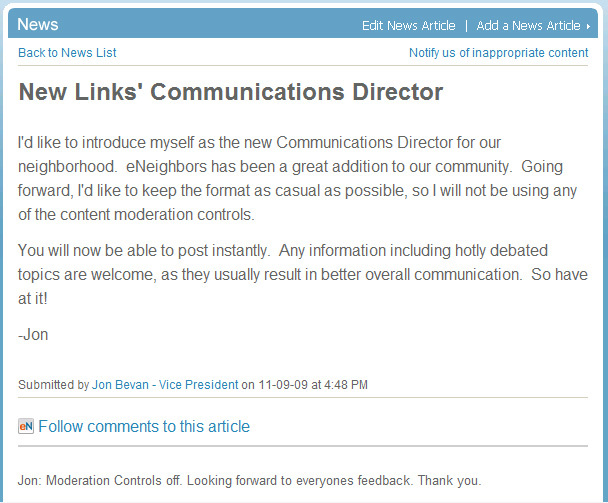 Jon Bevan, the new Communications Director for the Links at LionsGate neighborhood made the decision to turn content moderation off for his site. (See screenshot below.) If you are still using content moderation, consider following Jon’s lead and turn it off. To turn off content moderation on your site, sign in, click “Go To Admin Tool”, scroll down to the “Content Review” section and uncheck any boxes that are already checked. Then click “Save Changes”. Our content moderation was off until about a month ago. Unfortunately, not all who have access to the “delete button” as it has been called, welcome hotly debated topics as does the communications director who posted the blog in the above screenshot. Articles written to educate the residents regarding the rights they have as HOA members (quoting bylaws, etc. ), have generated the most comments and interest. Since being “moderated” the comments overall have fallen off about ten-fold.